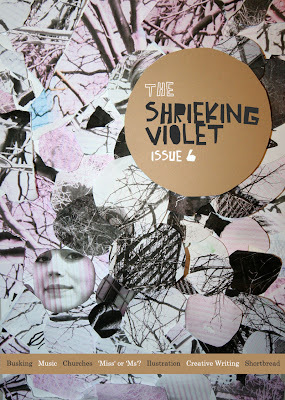 Issue 6 of the Shrieking Violet is now finished after a month's break (this hold up was largely caused by my busking article taking ages to write because of a series of mishaps such as getting stranded in Paris, all the buskers disappearing because of the snow, recovering from New Year and my phone breaking)! As well as my ridiculously long busking article, it features poetry by Richard Barrett, creative writing by Brewster Pius Craven and illustration by Andrew Beswick, Alex Boswell and Fuchsia Macaree. Rachel Cranshaw looks at titles of address for women and Tom Whyman visits a church. It is a kind of music special, with Matthew Britton of The Pigeon Post offering a guide to going to gigs alone. As usual, there are also listings and a recipe, which this month is vegan shortbread by Rebecca Willmott. This month's cover is by Alessandra Mostyn. A self-assembly pdf of issue 6 can be downloaded here (note for folding - page 2, Fuchsia's illustration, is separate to the rest of the zine and should be printed separately then inserted into the front, whereas all the other pages should be printed double sided then folded into the correct order). In addition, there will be about 50 paper copies, which might be found in some of these places - Koffee Pot, Piccadilly Records, Vinyl Exchange, Central Library, Oxfam Originals, Cornerhouse, Oklahoma, Manchester Craft Centre, URBIS, Noise cafe, Nexus Art Cafe etc - and, of course, Good Grief, the exciting new zine shop in Afflecks Palace! Unfortunately, the photocopier printed them a little bit grimy, but never mind! A LATE afternoon in January. At this time of day, the city would normally be packed with shoppers and workers, rushing about. But the city centre is all but silent. The pavements have been taken over by blocks of snow, which, refusing to shift for over a week, have worn smooth into ice. Workers have been sent home early, the city centre has ground to a halt. Those few people braving the treacherous streets do so through a wet fog of snow showers. The city’s still, the atmosphere oppressive. But one thing is going on as normal. The dreadlocked busker is still installed in a shop doorway on Market Street. The notes of a thumb-piano-esque African instrument follow you, clinging like the powdery snow that’s sticking to your face and eyelashes. Plip plopping, rising and falling in repetitive pitter-pattering sequences, his notes fight their way through the muffled air. It’s not weather to be tarried in, hence the deserted streets, and his fingers must be freezing, but still he’s playing on. It’s eerie and beautiful. Manchester is known as a musical city. You can go and see bands any night of the week. But what about the city’s other musical culture, the one that’s on the streets, open to everyone? These are the bands you stumble across during your lunch hour, that stop you in your tracks and leave you with a smile on your face for the rest of the day. Street performance may raise associations of earnest buskers with acoustic guitars playing predictable covers, and we often walk straight past them, but there’s variety and skill in Manchester street performers. Some greats of twentieth century music like Bob Dylan and Joni Mitchell started their careers on the streets, and in Manchester one performer who’s gone on to find fame is the former Britain’s Got Talent winner, teenager George Sampson from Warrington, who used to draw big crowds on Market Street with his dancing. Yes, there are guitarists churning out Dire Straits, an in-your-face Christian rap group and the slightly naff people dressed as Native Americans who play panpipes along to a backing track, but Manchester’s other performers range from African drummers to a trumpet and accordion jazz band and a man playing the intricate West African music of the Kora. One of the most unusual is the saxophonist who seems to only come out at night, often outside Kendal’s department store on Deansgate or, most strangely, amongst the damp and pigeon poo in a railway arch by round the back of Piccadilly train station. Add that to painters, human statues and even just people protesting or trying to raise awareness of a cause, and there’s a lot to grab your attention on the streets of Manchester. It also changes from season to season. At certain times of year, like Christmas, there’s an explosion in music students - string quartets, violinists and brass players practicing their classical repertoire. Many street performers move around, alternating between towns and cities like Stockport, Liverpool, Bolton and Blackpool. Others spend a block of the year in Manchester and the rest back at home in Africa. Manchester's city scape lends itself to street performance, from the fact that much of the city centre is pedestrianised to the backdrops formed by the concrete architecture of Piccadilly Gardens, the sound tunnel of the covered walkway at the end of Market Street and the steps that make an almost-stage outside Marks and Spencer. A familiar face on Manchester’s streets is Buddy the One Man Band, who plays at various locations up and down Market Street as well as spots like outside Marks and Spencer with his home made foot operated drum kit. He’s a distinctive sight, often wearing a waistcoat and hat adorned with badges. Salford musician David Budvar has been busking for thirty years including, for the past four or five years, three or four days a week on the streets of Manchester. His trade has also taken him from Japan to Australia and New Zealand, where the money is good. “I learned street samba from a Brazilian girl. It’s a mixture of samba moves and creativity - what you can put in. Samba and carnival was made for the street because it comes from the street. It’s a celebration of freedom. I come up with routines very naturally and quickly. I express myself through the music and incorporate handstands etc. as a show if the music moves me. People like to see what you can do,” Danny explained. Danny would like to see the council support street performers more by promoting them and creating defined busking spots so buskers could know when and where it’s safe and acceptable to perform. Busking often relies on negotiation and flexible arrangements over times and pitches, though recently there’s been tension with newcomers coming and ‘stealing’ spots. Other people would like to see more spaces opened up to public performance, for example Exchange Square, which was originally intended as a performance space before the Big Wheel took it over. Jali and Danny were invited to perform on a float in Jeremy Deller’s Procession in July. Part of Manchester International Festival, Procession was a celebration of the diverse groups of people that contribute to the life of the city. 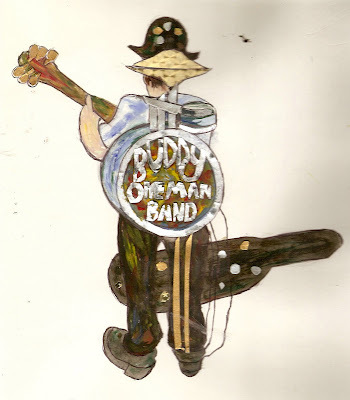 Buskers have also performed at events at Band on the Wall, such as Exodus Jam. However, not everyone has positive views on busking. Manchester School of Samba, a regular Saturday fixture outside Marks and Spencer, stopped busking nearly two years ago after complaints to the council and City Co*, the public-private consortium that manages the City Centre, about noise from nearby shops. One vociferous protester was David, from jewelers Arthur Kay and Brothers, a small, neat shop which directly faces the raised steps where MSS used to busk. “They were too noisy. We couldn’t hear our customers and they couldn’t hear themselves speak. It was even worse for shops like Accessorize who have their doors open with a warm wall of air. They couldn’t hear the telephone. Zara and FCUK didn’t like it either. It would be okay if it was only for an hour or so, but of course it‘s not because they need to make money,” he complained. He’s not anti-busking per se, though: “It’s the drums. Other buskers are just background noise, for example the official buskers at the Christmas markets.” As I leave, a saxophone rises sweetly through the damp end of day gloom, its riffs on The Girl From Ipanema twisting round the buildings of St Ann’s Square, while a lone saxophonist bobs up and down (“a lot of saxophonists just stand there apologetically - that’s why I try to move around a bit.”). Buddy comes and over and they exchange business cards, promising to ‘stick together’. Buddy offers to lend some equipment and suggests the saxophonist gets something to 'entertain the kids during the day'. He counters accusations of excessive noise pollution by arguing that when his group busked, it was a tourist attraction that encouraged people down towards that part of town, with up to a thousand people stopping to watch over the course of a typical Saturday. He also claims the band had the support of shops such as Marks and Spencer: “We helped increase trade. It’s a natural performance space and we drew people down to the shops there." “Street performance animates the whole city. It raises questions about what is the city space and what is Manchester? The more exciting cities like New York, Paris, Amsterdam and Berlin tend to have the more unusual, individual street acts. People have said to me that it’s one of the things that makes Manchester what it is,” Tony elaborated. He continued: “We set an exciting background to people’s Saturday afternoons. Every week was exciting. The things I enjoyed most were the little things. You might see someone at the back of the crowd and then they walk in time to the music, then they stop and listen and walk away smiling. That happened very often. 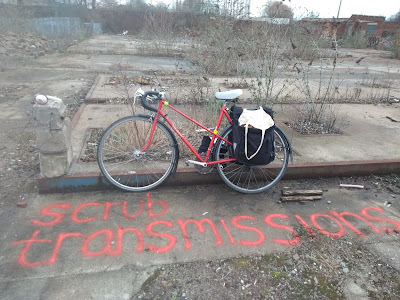 Single Cell, an art and music collective, share concerns about public space, saying their aim is 'to open up the city, to liberate space and use it for creative purposes'. They organised a Guerilla Busking event in the centre of Manchester last year, inviting both regular buskers and people who had never busked before to take part. Jonathan from Single Cell Collective explained: “In Manchester, in common with many other cities in the UK, public space is becoming increasingly managed, policed and privatised. Many 'undesirable' elements such as the homeless, graffiti writers and skaters are being excluded for spurious reasons." It seems a shame that the commercial and creative sides of the city can't coexist better or come to some sort of agreement - after all, with shops the same in high streets across the country, often blaring out the same chart music, surely busking offers something different to the city experience. Manchester School of Samba meet at the Dancehouse, Oxford Road, every Wednesday from 7.30pm-10.30pm, with dance and drumming. The New Year has got off to a good start, as the first new show I've seen this year is excellent. As the title implies, CUBE's retrospective of the British graphic designer Alan Fletcher's work is far more than just a parade of formal design for corporate clients - though there are plenty of examples of his classic designs for brands like Cunard and PAN AM. Some of his work for high profile organisations is still in use today - the V&A logo, for example. The exhibition is really interesting where it shows the blurring of the boundaries between art and design, and by extension life and design, and the ways in which art and design can be useful and incorporated into every day life. It also raises questions about how what we see is affected by what we're shown - how we react to brands, designs and logos, and the way in which they arouse in us connotations which have become instantly familiar. This worked both ways; Fletcher also quoted from life and what was around him, from incorporating the distinctive patterning of punched type tape into the Reuters logo to obsessively collecting piles of letters as examples of different typefaces. Although minor experiments, his collages comprised of these fonts are interesting; the word 'anonymous' is drawn from letters leaping out from themselves anyonymous newspaper articles, characters from the Coca Cola logo still spell nothing but Coca Cola in the mind even when removed from their context and recycled into another word. Sometimes, Fletcher's interventions of art into life are as small as letterheads. Few examples of design could be more appropriate for their purpose than the spidery, red, black and green handwriting that forms an apple logo for 'Parvits Products, purveyors of quality fresh fruits and vegetables', stamped onto an inventory of produce, or the words that taper into the shape of a wine glass for John Elliott Cellars, London. Amongst Fletcher's larger, more striking, public designs are London Underground posters advertising the various attractions of London, including one entitled 'Shopping' in which a bar code is integrated into the design, repackaged into a colourful, more human shopping bag. It's a reminder of essential financial reality of shopping, the bottom line of profit underneath the glamour and escapism of consumerism. Other highlights are his posters for public institutions such as museums and galleries, and a campaign from the early '70s against plans for the government to start charging for national galleries and museums. 'We the undersigned' is a simple but effective concept; a collection of the signatures of artists, from Bruegel to Van Gogh, their unique identifying marks easily recognisable. Fletcher's work is a lot more personal than much graphic design. As someone who's spent a considerable amount of time in Barcelona, I enjoyed his early sketches of familiar places like La Bouqeria Market and Las Ramblas, detailed and completely different to the simplicity of the design for which he became famous. Some pieces, like Fletcher's books The Art of Looking Sideways, or his imagined sketches of the new world as seen for the first time by the pioneers through a mass of ocean, and the sight of the Irish coast from Wales, viewed through a curtain of rain, almost make you laugh out loud, like not-so-distant distant relations of the cartoonish line drawings of David Shrigley. Others make reference to the tongue in cheek humour of the Victorian author Jerome K Jerome. His Christmas cards for children are similarly entertaining yet thought provoking. In one set, entitled 'A Primer for Commercial Children', a child's alphabet is already equated with branding - P corresponds to the Penguin logo, Q to Quaker. In another collage, the letters of 'EVIAN' are playfully rearranged 'naive'. A marker of good design is being able to imagine living with it, and my favourite pieces were Fletcher's calendars, ranging from a calendar celebrating key events of the year to a star sign calendar featuring inspired representations of each of the star signs in block shapes and colours reminiscent of children's paper cutouts. The most effective, though, is the weather calendar. With the barest components necessary - a few colours and basic shapes, Fletcher manages to sum up the whole of the British climate and its weather patterns - lived mostly in black and white, with a few months bursting into colour. Severe lines are scored across the page for a rainy March, May is a mere swathe of verdant green, July a flaming orange sphere with jagged edges. Autumn is summed up by a collection of wistful brown paper bag coloured shapes, December is a monochrome snowy sky. Best of all, November disintegrates into a scrawl of grey squiggles like the static on a TV screen. 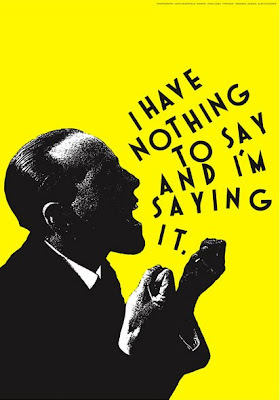 Alan Fletcher: Fifty years of graphic work (and play), until April 3 2010. Having read finally read the DJ Stuart Maconie's portrait of the north of England, Pies and Prejudice: In Search of the North (a Christmas present I gave my dad, both parents being avid listeners to his Radio 2 show, a year or two ago) whilst visiting my parents in Kent for Christmas, it was a delight to find another guide to the north was being broadcast on my return to Manchester. Great British Railway Journeys, which was shown this week, is a daily, half-hour documentary in which Michael Portillo takes the train from Liverpool to Scarborough in sections, exploring the country's first passenger railway line, which was opened in 1830, accompanied by the writing of 19th century train fanatic George Bradshaw. At 6.30pm, it's a welcome and educational alternative to Hollyoaks. On the surface, the two projects couldn't be more different — Maconie's a northerner, from Wigan, with a background in music journalism who presents radio shows on fairly obscure music, and Cambridge educated Portillo was once a controversial Thatcherite MP, but both offer affectionate portraits of the north that made me feel that, if I was the type of person who made new year's resolutions, I would resolve to get to know the north better and spend my weekends daytripping and taking more excursions by train. Interestingly, although Maconie grew up in the north, both broadly approach as outsiders. An exile to the home counties, the north Maconie returns to is in many ways greatly different to the one in which he grew up (especially the regeneration of the big cities such as Manchester, Liverpool and, most of all, Leeds). 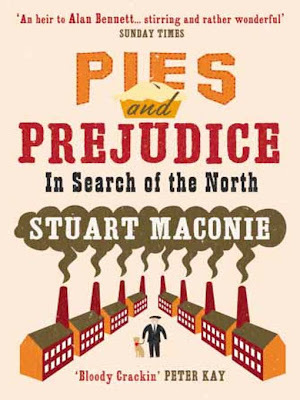 As the title suggests, Pies and Prejudice aims to in some way demystify the north and its rich heritage for southerners, many of whom have rarely ventured far north of London. Maconie's book also considers what it is to be northern — he seems to suggest there's a north west-north east divide almost as great as the north-south divide, with those from the north east considering themselves the 'true northerners' (as he points out, 'it's a long way away — not on the way to anywhere except Berwick or Oslo in a slow boat'). He touches on rivalries such as historical Yorkshire-Lancashire friction more than Portillo, who moves seamlessly from Cheshire to Lancashire to Yorkshire. Witty and opinionated, and written in an almost hyperactively detailed, dense style, Maconie's book isn't afraid to challenge and offer controversial opinions. In contrast, Portillo's a far more laid back host, offering an inoffensive presenting style and generally content to let the people of the north tell their own stories. He approaches a great range of interviewees, who exude a passion for the place they're from and what they do. These include workers at an Eccles cake factory, milliners at a hatmakers in Denton and Manchester historian Jonathan Schofield. A chicken keeper in Todmorden spreads the word of the town's grow your own food movement, knitters of fishing sweaters in Filey demonstrate how their craft has been handed down the generations and a jolly, smiley train spotter in York admits he's generally in his 'own little world' . Portillo gamely joins in various activities, having a go at folding his own Eccles cake, creating a trilby and even learning Scouse. One way in which both Maconie and Portillo present the north is through their culinary traditions, from Wigan's renowned pies and Uncle Joe's Mint Balls to the black pudding and flat bottom muffins Maconie samples in Bury, and the Indian food he eats in Bradford and Oldham. Fish and chips crops up over and over again in Portillo's programme as encapsulating the difference the railways made to people's lives - as he says, they entered 'every corner of people's lives'. Landlocked cities such as Manchester became inland ports, and people who would have previously only been able to eat locally caught freshwater fish were introduced to 'cheap and fast' meals such as cod and chips. Both Pies and Prejudice and Great British Railway Journeys are immensely educational, and obviously meticulously researched, covering historical events in a city's life and how they relate to today, in Manchester's case from the Peterloo Massacre - detailed by Maconie - to the IRA bomb. They also made me want to spend more time going on holiday in my own country, and realise how much there is to explore so close. Michael Portillo's Great British Railway Journeys can be watched on the BBC iPlayer here. The series continues at 6.30pm on BBC2 next week, with Michael Portillo heading north to Scotland via Cumbria.